Set the Correct Pass Rates For Your Org. Pass rate thresholds are pretty important. They define the acceptable accuracy rate by which a provider or coder passes or fails their coding audit. But despite the fact that pass rates help set a performance standard that organizations can use to measure and monitor compliance, only 66% of organizations conducting formal coding and documentation audits utilize pass rates. We all know that CMS allows for a 5% error rate on claims. But that doesn’t always correlate to a 95% pass rate threshold on audits. 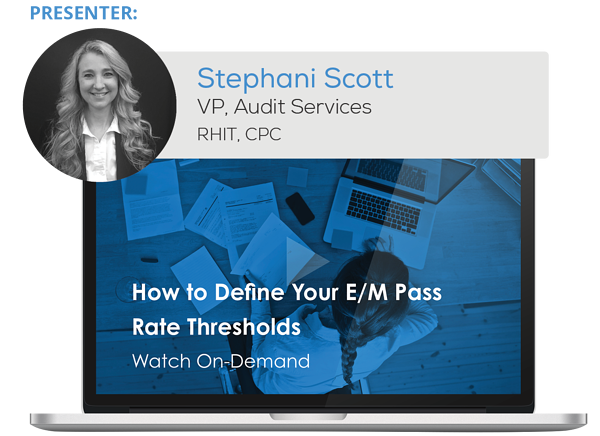 So when you’re setting pass rate thresholds, it’s important to understand how to measure your audits and the impact pass rates will have on your organization. Filling out the form below will allow you to watch the webinar for free. On the next page you will then have the option to purchase a CEU for $30. This program meets AAPC guidelines for 1.0 CEU. It can be split between Core A and all specialties with the exeptions of CIRC and CASCC. On-Demand views require successful completion of post-test for continuing education units. You will receive your CEU in a separate email after watching the on-demand recording.